How to raise a child with growth mindset? 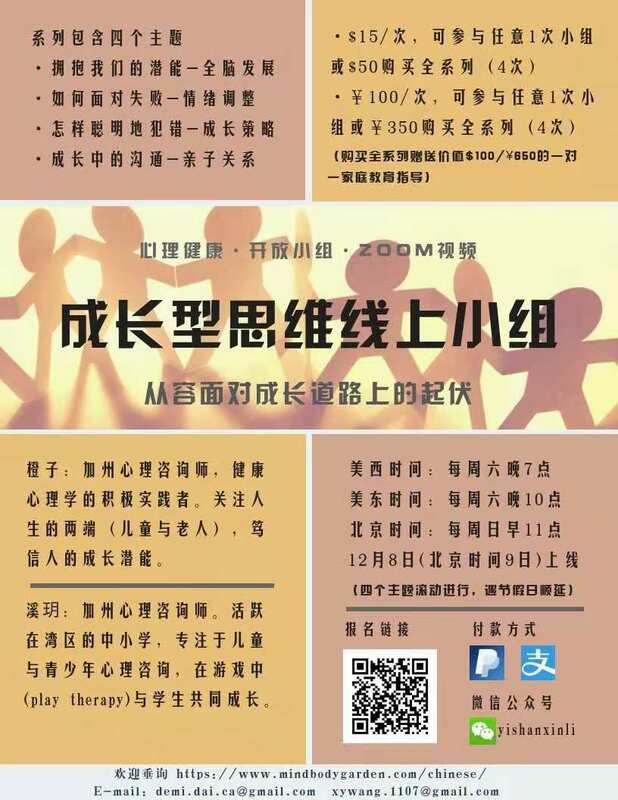 Please come to our free online webinar led by Ms. Xiaocheng Dai. Free Lecture for Valleyrain, a non-profit organization in SF Bay Area. If you have difficulty sleeping well, or have trouble handling stress which interferes with your sleep, welcome to join me for this free lecture about strategies and tips for stress management and a better night of sleep. This will be an activity in wechat group. This is not open to public but audio files will be uploaded to this website after the event. What: SFASA's annual day-long conference focused on planning for the support for Bay Area adults with autism and related developmental disabilities. We expect about 40 presenters and 400 attendees. Who: Our conferences are aimed at parents and professionals who have responsibilities to support and help make plans for adults with autism. Parents of teens who are planning for adulthood are also encouraged to register. What's the conference like? Mainstage sessions in the large conference room, with breakouts in the classrooms and lecture halls within the building. The day is packed with information, and also features information tables hosted by sponsors. For archives of past conferences see here. Will it be taped? The mainstage sessions will be taped and livestreamed for free. Is Spanish translation available? Yes. How much? Full-day tickets (8am-5pm) are $75 and include coffee and lunch; Afternoon passes (1-5pm) are $35 and include coffee. Prices do not include applicable fees. Scholarships are available. For information, please email info@sfautismsociety.org. Scholarships will be awarded in mid-November. Where is it? The event takes place at the beautiful, state-of-the-art Li Ka Shing Center, Stanford University, near the Stanford Medical Center. Please note that parking is located about 10 minutes from the Center. There are several parking lots near LKS. Lots L15, L16, L17 and L18 will be available. Parking is free on Saturdays. Use your GPS to take you to Stock Farm Road at Stanford. Handicap parking is available in front of LKS, off Campus Drive. Registrants will receive detailed information before the event. What time should I arrive? If you registered for the full day please arrive between 8 and 8.25am. The first 100 people through the door receive a free SFASA red knit beanie! If you registered for the afternoon pass, please arrive at 1pm. Either way, please allow 10 minutes to park and walk from the parking lot to the LKS building. Once at LKS, simply walk up the large outdoor staircase, registration will be on the landing. What should I bring? An ID for registration, paper and pen to take notes, a phone (and charger) for Spanish translation if needed, water bottle, and a tote bag for papers. If you'd like to purchase any SFASA logo items, bring some cash ($3-$10 each). Will the Information Table make a return? Yes! If you'd like to bring free flyers or brochures relevant to the topic of adult autism/DD feel free to leave your materials on our Information Table in the rear of the foyer. Can I volunteer? Yes! The conference is a labor-of-love volunteer-run event and we always appreciate help. Duties include still photography, time keeping, breakout room assistance, sponsorship calls, and more. Just email us at info@sfautismsociety.org. Can I sponsor? Of course. The sponsorship page is here. Accommodations: Regrets but SFASA does not provide advice regarding hotels or travel. Plus many breakout sessions on housing, social opportunities, financial planning, and more. Agenda is subject to change. Please checksfautismsociety.org/2017-sfasa-conference.html for a more details as they become available. Free livestream access information (mainstage presentations only) will be posted before the event. This event will sell out, so we encourage you to register soon. NO REFUNDS, though you are free to transfer your registration to a friend. For conference updates please "Like" our Facebook page and sign up for our newsletter. Let's read 《When breath becomes air》together this month. I cried multiple times while reading this book. Beautiful writing. Throughout November 2017, we will read and discuss Dr. Colleen Carney's book: "Goodnight Mind."